Which eBook are you interested in? How did you find Francorp's website? How does franchising compare with other growth systems? What are the chief traits of business that succeed in franchising? 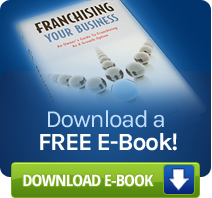 What results can a business expect from franchising? Why the Internet has revolutionized franchise marketing and how it works. How new profile franchisees give franchisors greater flexibility. The Franchise Advantage also profiles some “Big Winners” and up-and-coming franchises.